Table Covers, Table Runners, Tablecloths, and Banners are essential to look your best at trade shows, meetings, recruiting events and public appearances. 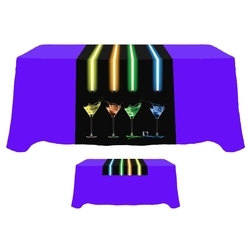 BigPromotions.net offers an extensive selection of trade show table drapes and covers. We take pride in providing the finest quality imprinted promotional textile products, whether stock or custom, one or a thousand, indoor or outdoor. Enhance all your display needs with our state of the art images and the finest textile printing quality in the marketplace. Full-color images are digitally printed, with NO set up charges!